Emotions feel automatic, like uncontrollable reactions to things we think and experience. Scientists have long supported this assumption by claiming that emotions are hardwired in the body or the brain. Today, however, the science of emotion is in the midst of a revolution on par with the discovery of relativity in physics and natural selection in biology—ans this paradigm shift has far-reaching implications for us all. Leading the charge is psychologist and neuroscientist Lisa Feldman Barrett, whose theory of emotion is driving a deeper understanding of the mind and brain, and shedding new light on what it means to be human. Her research overturns the widely held belief that emotions are housed in different parts of the brain and are universally expressed and recognized. Instead, she has shown that emotion is constructed in the moment, by core systems that interact across the whole brain, aided by a lifetime of learning. This new theory means that you play a much greater role in your emotional life than you ever thought. Its repercussions are already shaking the foundations not only of psychology but also of medicine, the legal system, child-rearing, meditation, and even airport security. Why do emotions feel automatic? Does rational thought really control emotion? How does emotion affect disease? How can you make your children more emotionally intelligent? How Emotions Are Made answers these questions and many more, revealing the latest research and intriguing practical applications of the new science of emotion, mind, and brain. LISA FELDMAN BARRETT, Ph.D., is a University Distinguished Professor of Psychology at Northeastern University, with appointments at Harvard Medical School and Massachusetts General Hospital in Psychiatry and Radiology. She received a National Institutes of Health Director's Pioneer Award for her groundbreaking research on emotion in the brain, and is an elected member of the Royal Society of Canada. She lives in Boston. 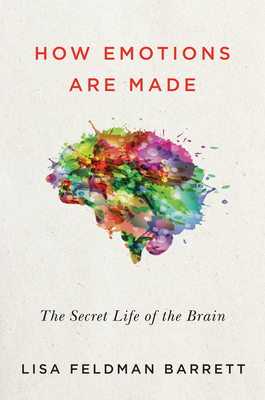 "Chock-full of startling, science-backed findings...an entertaining and engaging read." "Fascinating...a thought-provoking journey into emotion science." "I have never seen a book so devoted to understanding the nature of emotions...the book is down-to-earth and a delight to read. With a high level of knowledge and articulate style, Barrett delivers a prime example of modern prose in digestible chunks." "Drawing on neuroscience and experimental psychology to overturn the assumption that emotions are innate and universal, this book describes them as 'goal-based' concepts designed to help us categorize experience...Upbringing has the biggest influence, but we can all reshape our mental makeup and learn new concepts. The latter part of the book considers how doing so can affect our health, the law, and our relationship with the natural world. As Barrett frequently repeats, 'You are an architect of your experience.'" —The New Yorker, "Briefly Noted"
"A neuroscientist offers an enjoyable guide to a revolutionary scientific theory of emotion and its practical applications." "Prepare to have your brain twisted around as psychology professor Barrett takes it on a tour of itself... Her enthusiasm for her topic brightens every amazing fact and theory about where our emotions come from...each chapter is chockablock with startling insights. ...Barrett's figurative selfie of the brain is brilliant." "A well-argued, entertaining disputation of the prevailing view that emotion and reason are at odds...Highly informative, readable, and wide-ranging." "Barrett (psychology, Northeastern Univ.) presents a new neuroscientific explanation of why people are more swayed by feelings than by facts. She offers an unintuitive theory that goes against not only the popular understanding but also that of traditional research: emotions don’t arise; rather, we construct them on the fly. Furthermore, emotions are neither universal nor located in specific brain regions; they vary by culture and result from dynamic neuronal networks. These networks run nonstop simulations, making predictions and correcting them based on the environment rather than reacting to it. Tracing her own journey from the classical view of emotions, Barrett progressively builds her case, writing in a conversational tone and using down-to-earth metaphors, relegating the heaviest neuroscience to an appendix to keep the book accessible. Still, it is a lot to take in if one has not been exposed to these ideas before. VERDICT The theories of emotion and the human brain set forth here are revolutionary and have important implications. For readers interested in psychology and neuroscience as well as those involved in education and policy." "With How Emotions Are Made, Lisa Feldman Barrett has set the terms of debate for emotion theory in the 21st century. In clear, readable prose, she invites us to question both lay and expert understandings of what emotions are—and she musters an impressive body of data to suggest new answers. Barrett’s theory of how we construct emotions has major implications for law, including the myth of dispassionate judging. Her 'affective science manifesto for the legal system' deserves to be taken seriously by theorists and practitioners alike." —Baroness Helena Kennedy, QC House of Lords, U.K.